During Easter week 15th April to 21st April we are holding a special ‘Real Lives’ event. It will be lead by English evangelical speaker Mr Roger Carswell. We are excited to see the great things God will do on this week. 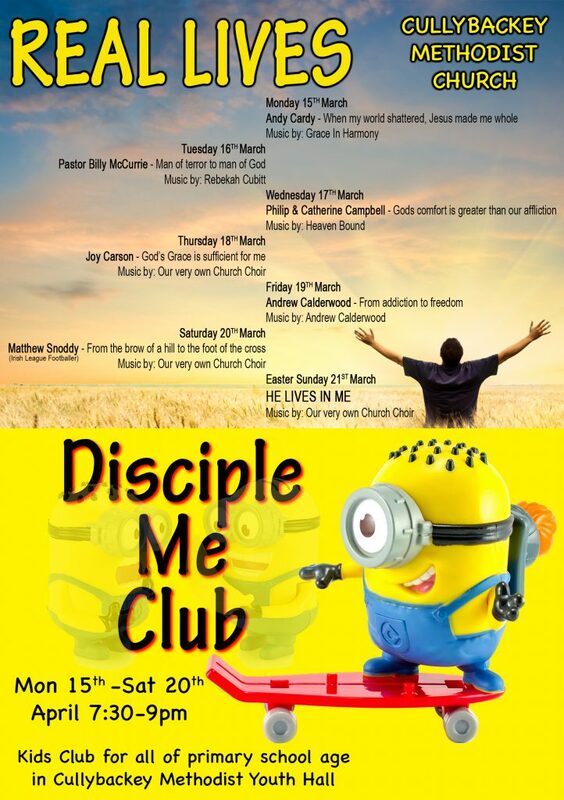 This is the time to bring someone along to Cullybackey Methodist to experience the warmth of God’s home. Spread the word and let’s fill the church during this special week! 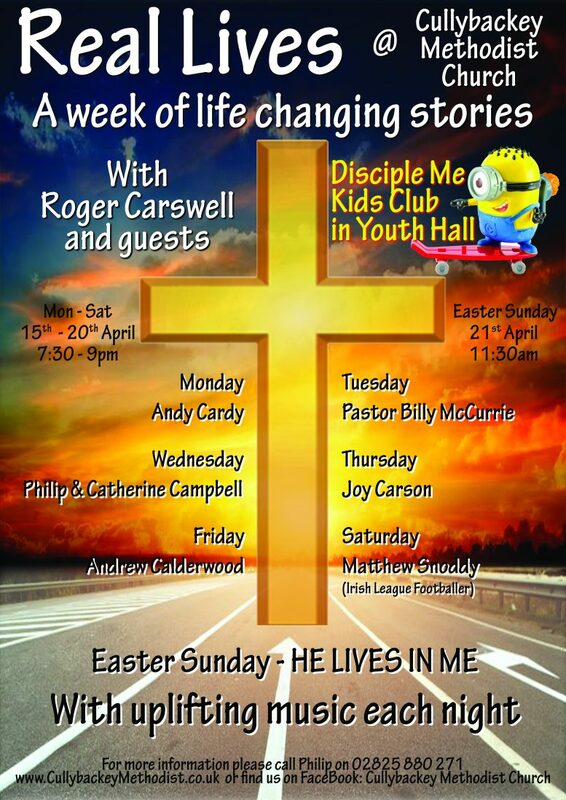 Roger Carswell: Roger is a much sought after Christian Evangelist from Leeds England. For over 30 years he has spoken at Christian events throughout the UK. He has a passion for sharing the gospel of Jesus Christ in a way that is deeply relevant to the circumstances and issues of life that we all face. Mon 15th 7:30pm Andy Cardy: Andy and Pat’s beautiful daughter Jenifer was taken from them by an unspeakable act of evil in 1981. In this interview Andy will share how he met Jesus in the aftermath of this tragedy and how Jesus has enabled him to live a whole and fruitful Christian live, defined not by hate and bitterness, but rather by love and forgiveness. Tues 16th 7:30pm Billy McCurrie: Billy is a former terrorist who was jailed for murder, but has since become a Christian pastor. In this interview he will share how Jesus transformed his life from being a captive of hate to being a captive of love. Wed 17th 7:30pm Philip & Catherine Campbell: Philip is a retired pastor and Catherine is a prolific Christian author. 2 of their 3 children were born with profound disabilities and died aged 10 and 13. At many times both questioned where is God in all of this. In this interview they will share how they found His comfort and peace to be greater than their affliction. Thurs 18th 7:30pm Joy Carson: Joy was born with albinism and faced many challenges growing up as a result of her condition. She came to faith at a young age. In this interview she will share about her wonderful Saviour, who kept His hand on her and caused good to come out of all her difficulties. Fri 19th 7:30pm Andrew Calderwood: Andrew is a well-known Christian singer. At a young age he got caught up in the nightclub scene and became addicted to drugs and alcohol. In this interview he will share how Jesus saved and freed him from everything that bound him. Sat 20th 7:30pm Matthew Snoddy: Mathew is a footballer with Crusaders FC. A few years ago due to gambling debts and personal struggles he was on the brow of a hill about to jump. In this interview he will share how a random phone call started a chain of events that led from that hill to a life transforming encounter with Jesus Christ.